In this guest post Joann Cattlin reviews Timeless Learning – How Imagination, Observation and Zero-Based Thinking Change Schools by by Ira Socol, Pam Moran and Chad Ratcliff. Timeless Learning by Ira Socol, Pam Moran and Chad Ratcliff is a call to teachers and school leaders to re-imagine schools and transform them into child centred, inquiry driven communities of creativity that engage all learners and provide them with the skills they need for the future. Timeless Learning is both a provocation and a guide to implementing big and small changes, told through the experiences of the authors, the educational theories which guide them and the stories of the students, teachers and schools they worked with. The authors have led successful transformations in Albemarle County Public Schools in Charlottesville, Virginia USA – Pam Moran as Superintendent, Ira Socol as Chief Technology and Innovation Officer and Chad Ratliff as Lab Schools Principal. They are recognised as leading change agents, winning numerous awards and share their work regularly in keynotes, blogposts and podcasts. While the US school system has particular features, the examples and insights in the book are relevant to many schools facing common challenges of standardised testing, limited resources and diverse student bodies. The ILETC team met Pam in 2017, after learning of the way Albemarle schools were supporting teachers to re-purpose traditional spaces and design new flexible and student-centred spaces, and invited her to be the keynote at the Transitions 17 event in Grand Rapids. 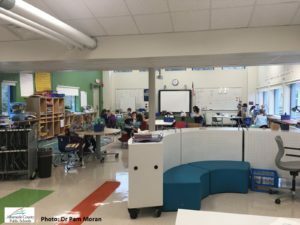 In our conversations with Pam we recognised many connections between our research and Albemarle schools’ holistic approach to supporting redesign or repurposing spaces alongside teachers to developing new pedagogies. The emerging issue for school design in Australia and New Zealand is the importance of including teachers and students in the development of design – in Albemarle schools the spaces are inextricably linked to the students’ and teachers’ needs. Timeless Learning provides a compelling blend of vision, research and examples of successful practices in Albemarle schools. The chapters are introduced with the authors’ personal reflections that give insights to their motivations and provide context to the major ideas in the book: creating change, 21st century skills, student engagement and leadership. The book does not claim to have the answers, or a neatly packaged approach to improving outcomes for students or implementing change in schools. It does provide a strong case for change using research, history and educational theory illustrated with the qualitative evidence from the authors work at Albemarle. At the end of each chapter are provocations, ideas for further inquiry and reflection as well as suggested actions. Change, how to inspire it, support it and defend it are a key element of the book. The book celebrates the power of individual teachers and school leaders to make small changes, take risks and build momentum towards system changes – a bottom up movement, enabled by top down support. It also highlights the importance of supporting teachers to try something new and risk failure, illustrating these with many examples of ideas which were prototyped and refined over time, from individual teachers’ use of technology to a schools’ development of a makerspace. Prototyping change enables new ideas to become reality while allowing for mistakes and refinement. The book discusses physical space as part of the learning ‘ecosystem’- a concept of learning space involving time, curriculum and activities. The examples of maker-spaces, labs and recording studios illustrate how ‘spaces’ for learning can exist outside normal timetabling, across subject boundaries and involve student defined activities. These spaces have transformed learning for many students who may have found traditional schooling difficult, through providing choices in how they learn and freedom to explore. Photo: Albemarle County Public Schools. Timeless Learning is inspiring, challenging and visionary as well as practical, instructive and supportive. While the authors’ vision for education will be revolutionary to many, their experience in transforming Albemarle schools highlights what is possible when you take one step at a time and embrace change.